Building on the successful Stellar range introduced in 2005, the Stellar X range has been built to full professional specifications for long life and reliable service. Stellar X flash units have more power then its predecessor along with tough aluminium bodies that will stand up to the most vigorous use. Fan cooling also ensures that the flash capacitors and associated circuitry are kept to their optimum working temperature even during periods of prolonged use. User changeable German flash tubes ensure both long life and colour consistency. The Stellar X is a fully redesigned unit which has many new features aimed firmly and squarely at the professional market. The "S" Type fitting now has a new mechanism, Auto Power Dumping and Auto modelling Lamp Dimming (during flash exposure ) Intelligent thermal cut-out device, greater air flow around the capacitors and a movable mounting bracket. The rear control panel houses a new grab handle and user friendly controls that allow not only the flash and modelling lamp intensity to be set but also the switches that allow the choice of audible or silent recycling indication and modelling lamp controls. Other features that are important to the busy professional include ‘S’ type bayonet fitting reflectors and accessories allowing a wide range accessories to be fitted. Sensitive infrared and flash sensors and five f-stop stepless adjustment of both flash and modelling lamp, fast re-charge coupled with audible and visual 100% recharge indicators add to the ease of use. A new and easy to use mounting bracket allows for repositioning and balancing of large or heavy softboxes ensuring the light is always facing in the right direction. We are the UK's biggest Interfit Studio specialist stockists with most equipment and accessories available for next day delivery. 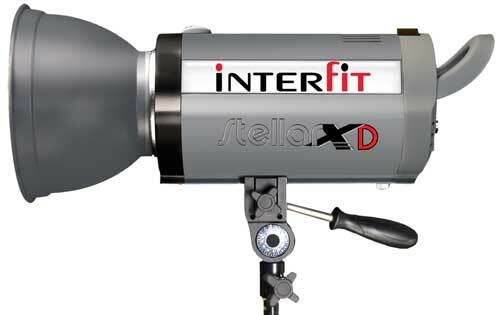 Interfit 150W Stellar Xtreme AC/DC Flash Head For Stellar Xtreme Battery Pack. Interfit 300W Stellar Xtreme AC/DC Flash Head For Stellar Xtreme Battery Pack.